Q-Games has been making a name for themselves as a developer that creates games that are a little bit different than the usual. PixelJunk Eden, for example, put you in control of a little creature called a Grimp, whose goal was to make gardens grow by swinging about a psychedelic landscape looking for Spectra. 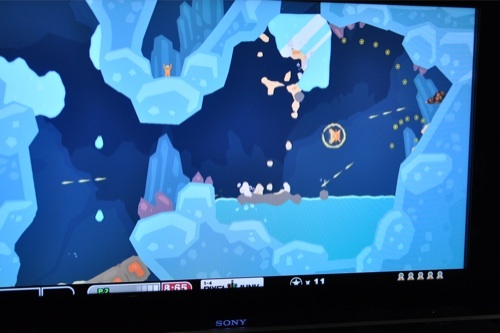 Their latest game, PixelJunk Shooter, puts you in command of a ship that is out to rescue trapped miners. Of course, it’s not as easy as just flying through a tunnel and picking the miners up along the way; devious enemies, pools of lava, and cooling lakes of water turns what should be a simple rescue mission into a wonderful co-op experience. 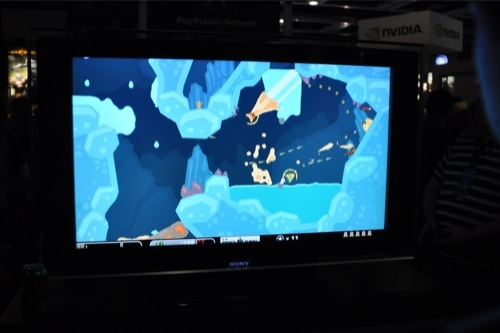 On our last day on the show floor at PAX, Jim and I swung by the Sony booth to take PixelJunk Shooter for a little test run. The ships are controlled using the left analog stick while the R1 button shoots your gun (which can be charged up by holding down the button for a bigger blast), and the R2 button fires out a grappling arm. This arm is multi-purpose and can be used to gather miners, diamonds, or, should the situation call for it, a buddy in distress. When we first started playing, everything seemed fairly straightforward; shoot a bunch of creatures, rescue some miners, and then break a wall holding back a pool of water to unleash it on a lake of lava. By the time we got to the third level, however, things started to shift slightly. As Jim and I mentioned in the special PAX Co-Opticast, the ships you control have the ability to divert the direction of falling water by shooting through it in much the same way you can divert water falling from the tap by moving your hand through it. One puzzle we faced had us diverting the flow of some falling water from one side of a lava lake to the other side. Jim, unfortunately, drifted a little too close to the lava lake and his ship started overheating. Although I tried to grab his ship using the grabbling arm and haul him up to the water to cool him off, I wasn’t able to get there in time. You see in PixelJunk Shooter, the greatest danger you face is overheating. As your ship gets hotter and hotter, a little circle of flame appears next to your ship. It starts off as just a semi-circle, but quickly grows the more time you spend near lava or getting hit by enemy attacks. If it fully encircles your ship, then you begin to lose control and your ship quickly starts to plummets like a rock towards the ground; or in Jim’s case, a fiery pool of lava. Should the unthinkable happen and you, or your partner, end up joining the Choir Invisible, don’t worry too much; after a set period of time, you’re thrown right back into the action. The entire time we played, Jim and I were laughing and enjoying the experience, despite his repeated shooting of the very miners we were supposed to save or frequent tumbles into the pits of lava. While I wasn’t able to get to Jim in time to save him from himself, the experience did serve to highlight some of the great co-op features of this title. Not only do you and your partner have to work together to save the miners by overcoming the various enemies that pop-up in your path or cooling the fonts of lava that often block your path, but sometimes you may be called upon to save the life of your partner. PixelJunk Shooter brings back the days of sitting on a couch with your friend and simply enjoying playing a game together.